She loves the challenges her law career offers, says AUT law alumna Katie Creagh who is now a solicitor at Anderson Creagh Lai Limited. “I enjoy being mentally challenged on a daily basis. I currently split my time between the corporate and commercial litigation teams. This means that my role ranges from drafting corporate agreements and resolutions, and assisting in corporate restructuring and negotiations, to drafting opening and closing submissions, statements of claim and other litigation documents. There were many highlights during her time at AUT, says Katie who received a number of awards throughout her studies and was selected for membership of international honour society Beta Gamma Sigma. “My highlight was giving the graduation speech on behalf of the graduands in my ceremony. It was an honour to be asked to give the speech, but the fact that I did it also reflected my growth at AUT. In high school I would never have dreamt of speaking in front of a large auditorium of people, but the presentations and moots I undertook as part of my law degree prepared me well for this. She also appreciated the contemporary nature of the AUT law degree. 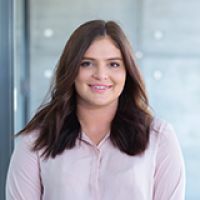 Katie, who graduated from AUT in 2018, has some great advice for other students. “Get to know your fellow students. I made some of my best friends at AUT. A law degree takes a lot of work and having a good group of friends to study with is much more enjoyable than studying alone. If you get the opportunity do the honours degree, she adds.